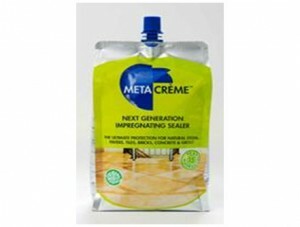 META CRÈME (1 qt) is the next generation of sealing technology, the ultimate invisible and breathable impregnating sealer for protecting natural stone, tiles, masonry, pavers, concrete, and grout. It represents the world’s best practice in sealing. META CRÈME provides an unmatchable performance and durability that surpasses all existing standards but is also environmentally cautious. META CRÈME starts working immediately on contact with the surface. Self assembling components enter through the tiny capillaries present in all porous building materials to deeply connect on a microscopic level to the subsurface. The treatment becomes permanently part of the material itself causing damaging liquids such as oil and water-borne salts to be repelled.